Kamal and his team celebrated World Snake Day for the first time in Rupandehi, Nepal! The first event for World Snake Day in Nepal was celebrated at No. 2 Talimgan, Sainamaina Byarek, Rupandehi. The awareness program was jointly organised at Sainamaina Byarek with Nepal Toxinology Association (NTA). 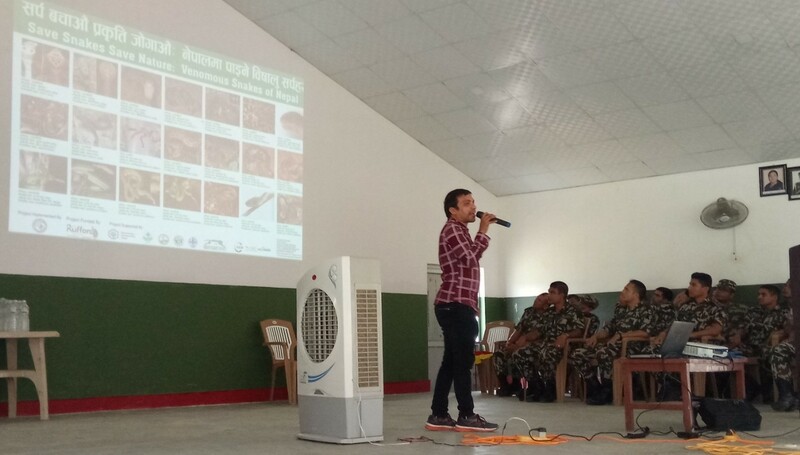 Approximately 600 Nepalese Army officers were present at the awareness program and gained knowledge about snakes, snakebite and snake conservation. Lieutenant Colonel Sameer Pratap Jung Rana was the Chief Guest of the program. Captain Naresh Bista, one of the Nepalese officers, helped with the execution of the awareness program which was a great success! Dr. Chhabilal Thapa of the NTA, gave a speech on snakebite management in Nepal and team leader Mr. Kamal Devkota gave talks on snakes, snakebite and snake conservation. They also distributed educational materials (Brochures, Posters, Books and Health Bulletin) to all the participants in the program. Nepal Toxinology Association (NTA) and Shankarnagar Ban Bihar and Research Centre jointly organized a second event, an interaction and awareness program at Shankarnagar. Local leaders, paramedical students, forestry students, local conservationists, snake rescuers and other community members were invited to the program. They also distributed educational material (Brochures, Posters, Books and Health Bulletin) to the participants.